Why not bring that tropical vacation feeling to work? That is what this client wanted, and a Kentia palm in a tall container did the trick. This table pop Neanthe Bella palm also added to the affect. The white furniture and walls also added to the island feel. 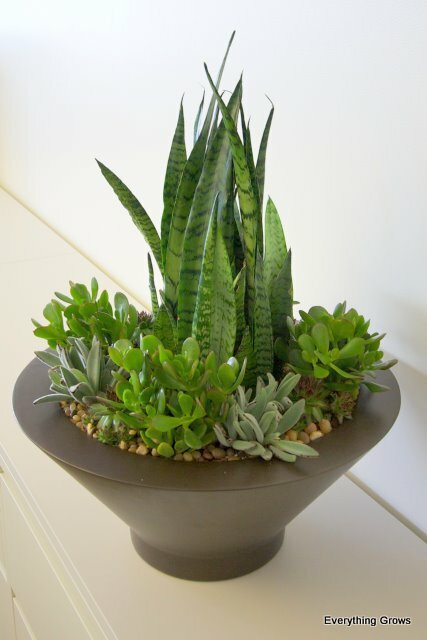 What a great impression this living plant arrangement in a gorgeous custom container makes to both employees and visiting clients. This one was installed in an account on our San Ramon Bishop Ranch route. This beautiful container is from the Restoration Hardware Zinc Tapered Planter line. The plant is an Aglaonema, and the combination of the plant and container really makes a statement in this modern space with cement floors and glass walls. These earth walls are an elegant living plant office divider solution in one of our Dublin / San Ramon client locations. They are used to separate the work area from a high traffic corridor. The plants used are Schefflera Arbicola Columns.